I was trying to buy the aigle bundle since this morning but nothing worked, i tried credit debit and paypal. Anyone have the same problem ? Did you check with your bank? Do you have international transactions allowed on your card(s)? Buying from WG in NA goes through Nicosia, Cyprus. Also, if it's a Visa gift card or similar, those are almost always shut off from international transactions. WG doesn't put roadblocks on you spending money with them, but banks will unless you tell them it's all valid. 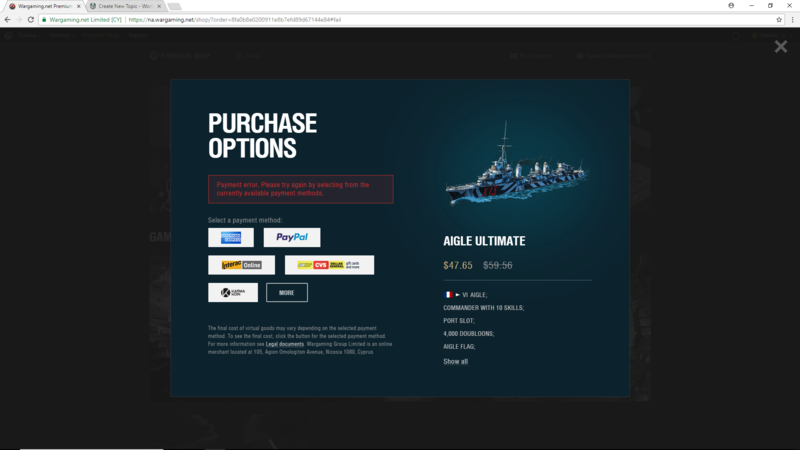 If this is working on WoT's shop, but not on WoWs shop: are you doing it on in-game shop, or web premium shop? Notice how VISA is not listed at all? I suspect you used a VISA card (gift or otherwise) prior to this and they decided you have reached the limit of what they are willing to sell you on that card. The only bigger joke than WGs e-commerce site is their customer service. When you contact them to point out that you just bought something successfully with your card and would like to use it again they hint that you are trying to commit fraud. This is one of the reasons I have shut them down. I had the opportunity to drop $50 on them today, but I figured they just weren't worth the hassle. So far, since Christmas, it's cost them about $500... well, $550 now. I would say someone was looking out for you. Take it as a sign and pick another ship. The premium can be a bit wonky at times. I tried to pay with a good card, wouldn't take it. Another card, it's OK.